After using the Moto Z, Moto Z Force, and Moto Mods for over a month now, I can give you some reasons why you would want to buy this modular smartphone. First, Moto Z and Z Force have up-to-date specs such as Snapdragon 820 processor, 4 gigs of RAM, micro SD card slot, and 5.5-inch 2560×1440 AMOLED screen. The specs are definitely up to date but it isn’t what make Moto Z special. What makes Moto Z line special is its Moto Mods, which include the projector module, JBL speaker module, battery module, and even Hasselblad Zoom Camera module. As a user of many portable projectors that require complex methods to make it actually work (such as Miracast which don’t work on all Android phones or is very hard to setup), the projector module gives you an easy way to mirror your screen to any surface. Now, this projector module also can be angled at many different angles, making it easy to project your screen on the wall or ceiling. As someone who spends hours in his bed watching Netflix and Hulu with bedrooom TV, I can’t tell you how valuable this is for someone who doesn’t have a TV in their bedroom. If there was one reason to get the Moto Z, it is definitely for anyone who wants the power of 42-inch TV in the palm of their hands. Of course, Moto Mods also offer the JBL speaker module, which is fairly loud and will allow you to ditch your bluetooth speakers. If battery is of concern, you can also grab the Incipio Power Pack, which is a battery module that will give you addition 2220mAh of power to your Moto Z and I believe this is a module you must get with the phone at the least. The battery module also charges wirelessly, meaning you can charge your battery module when you get home from work and keep using your phone. If you forget to charge your phone in the morning, simply slap on the battery module and you are ready to rock. You can also pick up multiple battery modules and use it like replaceable batteries without the hassel of powering off your smartphone, that is pretty awesome. When not using the modules, Motorola also offers clever backs you can use to hide the camera hump and make it easier to hold the phone. However, if you are not planning to pick up any of these modules you are missing the point and you may be better off with another Android smartphone. Apart from all the excellent Moto Mods, the Moto Z and Z Force fairs well with excellent performance and UI rivaling Nexus smartphones without much lag and exceptionally fast speed. Fingerprint sensor is also one of the fastest I’ve tried and it is much faster than my Galaxy S7 Edge/Note 7. As for camera, Moto Z offers 13MP F1.8 back camera while Z Fore offers 21MP F1.8 back camera. Back camera performance keeps up with the best flagships for both photos and videos while front camera is average. If you need excellent selfies in low-light, you may want to look elsewhere although with the front flash, you may be able to get away. This is also the first flagship smartphone to not include a headphone jack. (Sorry I don’t consider LeEco or Oppo brands as flagships yet.) Yes, iPhone 7 wasn’t the first. 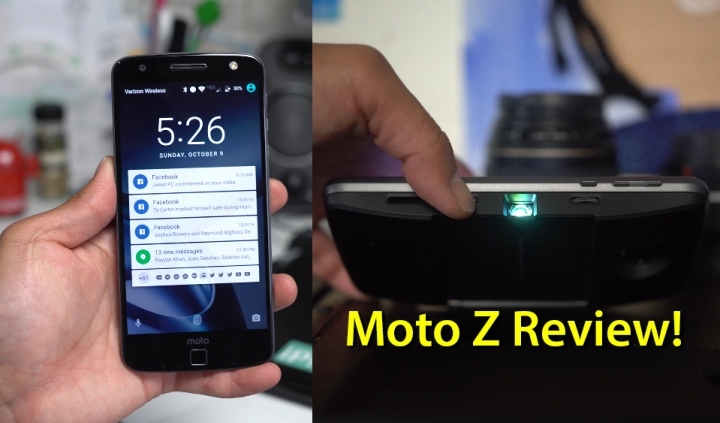 This is one feature I don’t like about the Moto Z but you may get used to it. Overall, Moto Z line of smartphones are very impressive, definitely on another level from LG’s try at modular smartphones with LG G5. If you are going to pick one up, definitely try to get a bundle deal with a few modules or at the very least grab the battery module. Previous story $1500 Sennheiser HD800S Unboxing & Test w/ LG V20 DAC!